I think it’s best if we all put the past few weeks behind us and look forward to some spring golf. It’s good to see fairways being cut, the greens looking perky and the days getting longer. The course has stood up rather well to the winter onslaught in my humble opinion; it has fared far less well in winters past. I played the Aylesford Course at Forest of Arden mid March and I can tell you that carrying there was hard work, so much standing water and mud everywhere. We pray for a drier spell prior to the C Team away days there over “The Masters” weekend. It was good to see the Club AGM on 22 March so well attended; thank you to all who made the effort and to all those who contributed to the debates. After much discussion,the status quo was maintained for another year regarding fees and range pricing. Brendan Boyce became our new Golf Operations Director with Pat Lee standing down after several years of valuable and much appreciated service. Thanks Pat for all your hard work. Brendan will be ably assisted by handicap guru Doug Woolley. I was presented with the Captains’ Tankard to mark the official start to my year as Club Captain. However, outgoing Captain Ian Solloway forgot to fill it first! No surprise there then. Brendan celebrated his new role by buying a new pair of golf shoes from Tony, immediately declaring them to be “like slippers”. Keen to experience this new-found comfort he set off on his round with Vice Captain Gerry; all seemed to be going well until the 5th hole when Bren was spied putting in his stocking feet! “Bloody shoes have given me blisters” he was heard to mutter. Glass slippers then Twinkle Toes? I should also mention that Gerry appears to feeling the strain of Vice Captaincy already. When he arrived on the 1st green he realized he’d left his putter in the car! The clubs social calendar kicked off with a successful Steak Night with 70 odd members enjoying a well cooked steak and trimmings, good company and a little dancing to while away the evening. The Italian Night in March was also well attended. My away day and weekend are now full, with reserves still champing at the bit to get in! 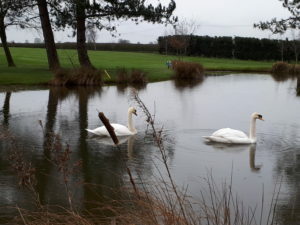 I’m pleased to be able to tell you that I have secured an additional Tee time at Coxmoor GC so I am able to now take 36 players whom have been advised accordingly. If you have your name down to go on the away day, but have not yet paid PLEASE COUGH UP ASAP as I will need to send a wedge of cash to Coxmoor very soon. I am also hoping to extend the away weekend to 36 players and will let you know as soon as I am able to confirm this. I really enjoyed my first Seniors Team home game v Humberstone on Tuesday 27th March. In decent weather, Al Terzza and I won convincingly and Melton won the match 6.5 – 1.5. Most of the other team matches kick off in April so keep an eye on the notice boards in the locker rooms and let the respective team captains know your availability if you would like to get involved. Trust me, they are an ideal way of playing some fine courses, meeting new friends and honing your game for very little outlay. That iconic horse race The Grand National will be run on the afternoon of Saturday 14th April and, to further delight race fans, we’re having a Race Night at the club the very same evening. I met with Justine the event organiser today to have a run through of the evening and I think it will be a really fun event. Eight races projected on screen, 8 horses per race, a fully automated betting tote to work out prize money and a bottle of champagne for every winning owner (already sold out). So, come along and support this fundraising event for both the club and Club Captain’s and Lady Captain’s Charities, bring your friends and neighbors. Non-members are welcome to enjoy this one. Basket food will be available throughout the evening. There will also be the “Key to the Door” with the prize money already topping £1000 and only 9 keys left, it’s going down to the wire, and you don’t want to miss your chance. 7 for 7.30, food available from 6.30 for those wanting to eat early. Book with Angie at the bar. See you all there. Thanks for reading; see you all soon.